It is not enough to teach children how to read, write and count. Education has to cultivate mutual respect for others and the world in which we live, and help people forge more just, inclusive and peaceful societies… We must support peace education programmes, protect students and teachers from conflict, help rebuild schools destroyed by war, and ensure all girls and boys have access to a quality education that includes learning about resolving and preventing conflicts. Invites all Member States, organizations of the United Nations system, regional and non-governmental organizations and individuals to commemorate, in an appropriate manner, the International Day of Peace, including through education and public awareness, and to cooperate with the United Nations in the establishment of the global ceasefire. 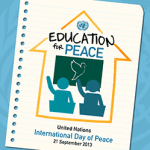 Supporting the goals and ideals of Peace Day. Resolved, That the Senate expresses its support for the goals and ideals celebrated on Peace Day, which is observed each year on September 21; supports continuing efforts to raise global awareness of the goals of Peace Day and to engage all sectors of society in the peaceful observance of the International Day of Peace, in accordance with United Nations General Assembly Resolution 55/282 of September 7, 2001, including work with United Nations agencies and non-governmental organizations to promote life-saving and humanitarian activities on Peace Day; and encourages people in the United States to observe Peace Day, September 21, 2009, with appropriate programs, ceremonies, and educational activities, in order to raise awareness of the need for peaceful resolution of conflicts of all kinds.